Beautifully engraved certificate from the North Western North Carolina Railroad Co. issued in 1888. 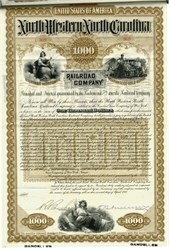 This historic document was printed by the American Banknote Company and has an ornate border around it with a vignette of Justice seated on throne top left, loco r-l at station top right, Agriculture bottom. 87 unused coupons attached on top. This item has the signatures of the Company�s President and Secretary. North Western North Carolina Railroad from 1868 to 1894. Merged with Southern Railway.